This concert release captures a dynamic live rendition of the full Quadrophenia album, performed during The Who's 1996-97 U.S. Tour. Special guests include Billy Idol and PJ Proby. 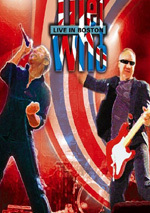 Behold as before our very eyes, the Who make a mockery of the “farewell tour” concept. The band initially parted ways in 1982. They came back briefly in 1989 to commemorate the 20th anniversary of their landmark album Tommy, and that looked to be it. However, in 1996 the band returned to play their 1973 release Quadrophenia in its entirety. While they often did full Tommy performances back in the day, they’d never done Quadrophenia from start to finish. The timing seemed odd – a 23rd anniversary tour? – but at least the occasion marked something different. Since then, they’ve never really gone away. Even after the 2002 death of bassist John Entwistle, the band continued to tour. Pete Townshend continues to tease us with the notion that he and Roger Daltrey – the only other surviving original member – will put out a new Who album, but it’s been a long time in the making, so I’ll believe it when I see it. This DVD looks back at the second of the band’s first two “reunion” tours. We get a full performance of Quadrophenia from 1996. When the band first did the album that year, they weren’t billed as “the Who”. From what I understand, Pete Townshend refused to credit them that way. 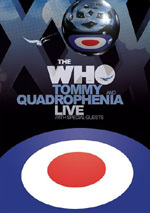 As such, the billing read “Pete Townshend, Roger Daltrey and John Entwistle Present the Who’s Quadrophenia”. Some fans may also have been intimidated by the prospect of an evening devoted so strongly to one work; while other Who tunes appeared during the show, Quadrophenia remained the focus. That might be why the tour tanked in some spots. Initially they planned to only do a handful of dates at Madison Square Garden. Heck, I traveled up for one of those shows simply because they were touted as the only North American dates. Imagine my annoyance when they came to my area four months later – and the show sold so poorly that they offered tickets in a “two-for-one” deal! Although Quadrophenia offers a production even more elaborate than Tommy, it works better. Perhaps some of that’s because it lacks so many distracting guest stars. Perhaps it’s partially because they’d gotten Tommy under their belt and had a better idea of what worked and what didn’t when they hit Quadrophenia. Whatever the case, Quadrophenia works fairly well as both storytelling and music. The visual production presents a real mix of multimedia elements. Some of this had been abetted for the video presentation, but most of it comes straight from the stage show. In addition to the band shots, we see some archival materials, clips from the Quadrophenia feature film and narration/acting from Alex Langdon as Jimmy, the main character. All this meshes pretty well. Admittedly, I’d prefer more shots of the band, as they go missing for some moderately significant chunks of the show. At times when it leaves the stage for film footage, we lose the band for too long. This isn’t a major complaint, but it creates some distractions. At least this all operates to tell a decent story. This “acting” in Tommy is too goofy and disjointed to service the tale, but the story elements of Quadrophenia make it pretty clear and interesting. Langdon overacts, though I blame the format for that problem; he had to emote to fit the arena setting, so I can’t fault him for coming across less well in a home setting. Though the band is virtually the same size as the one that played Tommy, for some reason it seems more rock and less Broadway here. Perhaps that's because they have a better-integrated feel. The 1989 group came across as a bunch of hired hands, whereas this one feels better knit. The 1996-97 Quadrophenia doesn’t represent the Who anywhere near their peak, but it’s an ambitious undertaking that mostly succeeds. It certainly works better than the glossy 1989 Tommy, though some of that’s the case simply because Quadrophenia is the stronger album of the two. (I like Tommy but regard it as radically overrated.) It’s good to see Quadrophenia again after 10 years. 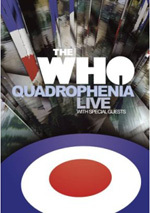 The Who: Quadrophenia Live with Special Guests appears in an aspect ratio of 2.35:1 on this single-sided, dual-layered disc. Quadrophenia has not been enhanced for 16X9 televisions. Never intended for public consumption, this was a problematic presentation. One negative of Quadrophenia came from the lack of anamorphic enhancement. Fans may not gripe too much, though, since they’ll be happy to simply get a commercial release of this show. 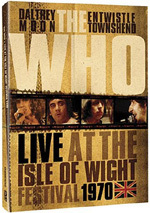 The DVD’s booklet notes that “the show was only filmed for the band’s archives”. That disclaimer should set us up for poor quality, and to a degree, that’s what we got. Nonetheless, the picture looked eminently watchable and didn’t suffer from any fatal flaws. Given the source material and the lack of anamorphic enhancement, sharpness faltered at times. Those segments were erratic. Some wide shots looked crisp and distinctive, while others were soft and fuzzy. In general, wider images tended to be a bit rough and edgy, as I noticed jaggies and a little shimmering. Definition was consistently decent, but it lacked great clarity and accuracy. Source flaws manifested themselves in the form of video artifacting, an issue that became moderately prominent at times. Otherwise the presentation was clean. Colors also varied. Most of the tones came from stage lighting, though a mix of hues popped up in the filmed sequences. The stage shots tended to be runny and messy. They lacked that video glow seen in the Tommy segment, but they were never particularly tight or vivid. The filmed parts presented stronger hues, though they remained fairly lackluster. Blacks were acceptably dense but nothing special, while low-light shots could be thick and murky. Given the fact this production was never meant for public consumption, it looked pretty good. Just don’t expect professional quality material. As for the audio, Quadrophenia boasted a Dolby Digital 5.1 soundtrack. It had flaws in terms of soundscape and quality. The imaging essentially came across as broad mono. The material didn’t explicitly concentrate on the center channel, but it also failed to spread instruments and vocals across the speakers with any distinct definition. I heard elements from the different spots but not to a degree where I could pinpoint them at all. This was a mushy soundfield without any real stereo presence. Audio quality wasn’t much better. Much of the time it sounded like a really good audience recording. Vocals lacked natural tones since they displayed lots of arena reverb. The rest of the track demonstrated a lack of dynamics. The music stayed in the muddy mid-range most of the time. Highs were a little rough, while lows lacked punch or depth. Just like the picture was always perfectly watchable, I didn’t mind listening to Quadrophenia. Nonetheless, it failed to present a high-quality auditory experience. A scaled-down version of the product that originally appeared as a three-disc set of Tommy, Quadrophenia and extras, only a few of those bonus materials move to this release. We still find a visual commentary. This features remarks from Pete Townshend and Roger Daltrey, both of whom were recorded separately in non-screen-specific situations. The “visual” part is little more than a gimmick. We see Pete or Roger onscreen as they chat. It adds nothing to the presentation, which otherwise is a standard audio commentary. Or compilation of related interview snippets, which is a more accurate description. Not that I mean to insult the commentaries, for they’re actually quite good. The visual aspect of the tracks is a fairly useless gimmick, though. On a few occasions, it comes in handy, such as when Townshend demonstrates a dance. Most of the time it’s not much help, though. At least the content of the material is strong. We learn a little about the concerts and the musicians, but mostly Daltrey and Townshend discuss making the album and interpreting it. This means Townshend comes to the forefront and provides most of the information. Daltrey gets in some nice comments, but since Townshend wrote the album, he becomes the focal point. Pete always has been one of the great interview subjects, and he continues to offer concise, interesting information here. There’s a little dead air at times, but overall this is an excellent discussion. We also get a seven-minute and 48-second program called The Quadrophenia Story. This includes behind the scenes footage and comments from Townshend and creative co-director Aubrey Powell. The latter offers the majority of the material as he discusses the development of the 1996-97 performances, the roots of the story, and bringing about the tour. It’s an informative and enjoyable little piece. What does this package lose from the three-DVD set? Not counting the Tommy material, it drops the 32-minute encore from the Quadrophenia concert. That means we don’t get its 13 songs and 68 minutes of music. This version also omits a featurette about Billy Idol’s participation in the Tommy and Quadrophenia revivals and a fine booklet about the Who. Arguably the most legendary live rock band ever, fans won’t find the Who at their best during this Quadrophenia Live DVD. Still, it includes many good moments, and it comes with plenty of music to entice fans. The DVD offers erratic picture and audio, largely due to problems with the source. Both are acceptable, and we get a decent collection of extras. This DVD is probably best left to the big Who fans, all of whom will want to get the three-disc version instead. I like the show for the most part, but the lackluster visual and audio quality will likely turn off less dedicated partisans.